We just got back from five relaxing days in Naples Florida visiting my in-laws. Prior to leaving Mark made plans to go fishing. (As if he doesn’t get to fish up north . . .whatever.) My mother-in-law, not wanting to me to ‘work’ while I was on vacation, asked if I wouldn’t mind making dinner if Mark caught fresh fish. Are you kidding me??? I absolutely LOVE to cook. And with freshly sourced ingredients??? Count me in! The plan? To make fried fish and chips. But that plan was about to change. More about that later. Mark booked his fishing trip with Saltwater Cowboy Charters out of Naples Florida. He wasn’t sure what they would be fishing for but he was ready to go – bright and early – at 7:30 AM. Now I’ll rewind. We normally visit the in-laws alone but this time we were there with Mark’s brother. His brother, Paul, is a great cook and when they started catching fish he decided he’d rather have fish tacos which was totally fine with me. So the guys came back with snapper fillets, flour tortillas, shredded cabbage, yellow and red peppers and jalapeno peppers. With that kind of inspiration, I was on the fish taco train. Normally I do a blackened fish taco with cabbage slaw but the crowd wanted fried. I’m not including the recipe for frying the fish. I did the dredge in flour, dip in egg, dredge in panko/potato buds/bread crumbs mix for the coating. Easy peasy. The star, though, was the slaw. I apologize that this isn’t an EXACT recipe. It’s literally shredded cabbage, some thinly sliced red onion, thinly sliced yellow and red peppers, jalapeno to taste, salt, a dollop or two of sour cream, cilantro and lime juice to taste. That’s it! I wish it were more complicated than that, but it isn’t. The key to this is salt and lime juice. What I like about a non-recipe is that you just can’t get it wrong. You make it according to YOUR taste. If you don’t like cilantro, leave it out! If you don’t like heat, then don’t add the cilantro! Make it the way you like. No green cabbage? No problem. Substitute red cabbage or thinly sliced bok choi. I made a small batch and we totally killed it with the tacos. It was so good that we made another batch later in the week. Fresh cabbage slaw for tacos. To serve, we warmed up the flour tortillas, added a fillet (or two) of fish, slaw, salsa and more thinly sliced jalapeno. 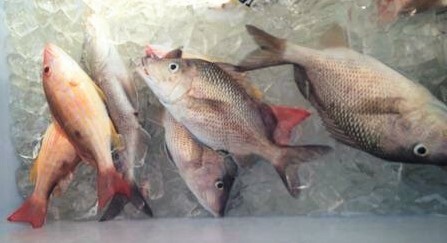 There really is nothing like freshly caught fish. So good! 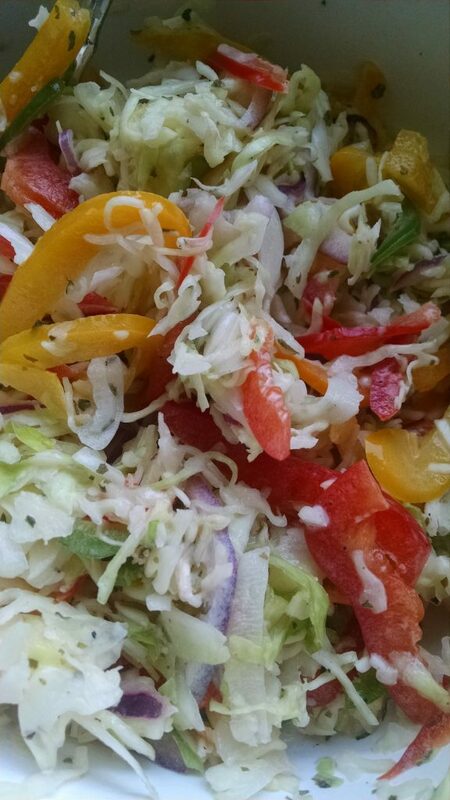 If you want to try making the slaw and have questions, just comment below. I’ll do my best to help you get it right for you and your family.